Armed with faith, their lives are transformed through grassroots partnerships that provide new skills and resources to increase household nutrition, healthcare access, and income security. Diagnosed with polio at the age of four, Rose never regained the use of her legs. She grew up in the midst of the South Sudan conflict. But when her husband was killed in a rebel attack, Rose and her three young children fled for safety. For two months, the family traveled through 100 miles of east African wilderness. Rose crawled on her hands and calloused knees across the hot, rocky terrain with sandals on her palms to protect them from rocks, thorns, and scorpions. 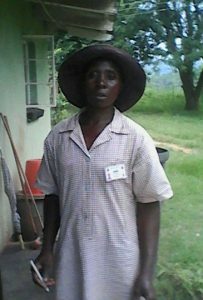 After their desperate journey, she and her children crossed the border to Uganda and reached Palorinya Settlement in Moyo district. Without a home or tent, Rose and her children slept under a tree at night. 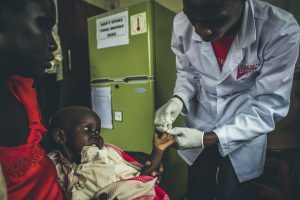 Without proper shelter or coverage, the family was exposed to malaria, a leading cause of death in the refugee population. Thankfully, Global Ministries’ partner, Medical Teams International, is present in the refugee camp. MTI tested the family and provided malaria treatment. Rose and her family are among the hundreds of thousands of South Sudanese refugees living in the camp. Eighty-six percent of the population there are women and children. As Rose shared her journey, tears spilled off her cheeks onto her baby, cradled in her arms. She embodies courage, tenacity, and an unrelenting will to survive. Sekai has two young children. Though she has given birth to six, four have died from malaria. Her church believes in faith healing which means believers are forbidden from seeking care at health facilities. After losing her fourth child to malaria, Sekai wasn’t going to take chances with her next baby. 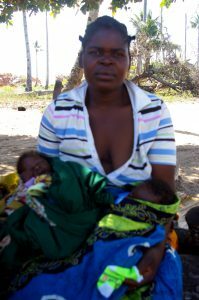 Sekai now encourages other mothers to go to the clinic at the first signs of malaria. When Joana’s husband passed away, she was forced to go through “pitafuka,” a purification ritual for widows. The family of her late husband chose a man to “cleanse” her by having sexual relations with her. But Joana received no support from her deceased husband’s family after learning she was pregnant. A community health volunteer from the United Methodist Cambine Health Center came alongside her. “She visited often and encouraged me to attend prenatal visits,” said Joana. With help from the volunteers and nurses at Cambine Health Center, Joana learned how to breastfeed her twins and was referred to social welfare services to receive widows’ assistance. 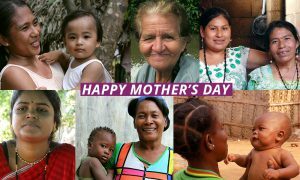 Mother’s Day is a time to celebrate the contribution women make in the world. In honor of women everywhere, let’s step into the tragic brokenness of the world with prayer and support for those in need of treatment, healing, and belonging. Let’s celebrate women who fiercely protect and nurture their children. Let’s be like them and look at each other with fresh eyes, appreciation, and love. Share your stories with us! Tell us how the women in your life engage in health to promote wellness in the body, mind, and spirit. *Kathleen Griffith is program manager for Global Ministries Maternal, Newborn and Child Health program. Dr. Olusimbo Ige is executive director for Global Ministries’ Global Health. Compiled with reports from MTI Uganda and contributions from the Rev. Arlindo Romao, Health Coordinator, Mozambique Health Board and Hannah Mafunda, Health Coordinator, Zimbabwe Health Board.